“I did not know that mankind were suffering for want of gold. I have seen a little of it. but not so malleable as wit. “Everyone can get the gold of the Sun. When will come the season mild? “This grand show is eternal. a shower is forever falling; vapor is ever rising. “Your strength doesn’t come from winning. It comes from struggles and hardship. and a reflection of living. “I am the bended, but not broken. I am the power of the thunderstorm. I am the beauty in the beast. I am the strength in weakness. I am the confidence in the midst of doubt. but it will get better, I promise. It’s time for you to move on. There is something totally magical about flowers blooming on woody stems. Flowers, so fragile and soft, breaking out of weathered bark as winter draws to a cold and windy close will always fascinate me. Since I was a child, these natural wonders have held my attention. Now, living in a Forest Garden, we have surrounded ourselves with flowering shrubs and trees. They are sturdy yet beautiful, easy to maintain, and remain a lasting presence from year to year. Their early flowers feed hungry pollinators when there is little else available. “Double Take Scarlet” Japanese Quince, Chaenomeles speciosa ‘Scarlet Storm’ in its second year in our garden. It has proven hardy and deer resistant, so I am watching the local garden centers for more of these shrubs to appear. I would like to plant at least one more. After a cold and wintery week, we are happy to greet the sun and its warmth today. We have uncovered the Hydrangeas again, lifted sheltering pots off of our new perennials, assessed the damage wrought by nearly a week of nights in the 20s, and done a little more pruning. But mostly, we have admired the many flowers opening now in the garden on this Fabulous Friday. The peach blossoms weathered the cold without damage. Although the Magnolia blossoms and Camellia blossoms turned brown in the cold this week, there are still buds left to open. The damaged flowers will drop away soon enough. And the fruit trees are just getting started! Redbud flowers erupt directly from the trunk and branches of the tree. This is the species, Cercis canadensis, which grows wild here. Newer cultivars offer flowers in several shades of pink and lavender or white. Some also offer variegated or burgundy foliage. If I were asked for advice by someone just starting in their garden, I would steer them towards flowering woodies. The shrubs, or trees, themselves provide great garden structure year round. They provide a permanent presence over decades, with little input from the gardener once they are established. And when they bloom, Wow! What amazing ‘bang for your buck’ when a flowering tree covers itself with thousands of perfect blossoms. It may last for a few weeks only, but what ‘gorgeosity’ in the garden when they bloom! Even when the blooms are finished, there is still much to enjoy from their beautiful bark, leaves, fruits and berries. Many flowering trees return with gorgeous fall color to end the season. March 1, when the flowering Magnolia trees were covered in blossoms. There are great flowering woodies to enjoy in a mid-zone garden (6-9) through the entire year. When you might expect a short break in late January through mid-February, while even our hardy Camellias stop blooming, the Mahonia, Forsythia and Edgeworthia fill the garden with fragrance and color. Now that the annual show has begun, we await the Azaleas and Rhododendrons; Lilacs; several species of Hydrangeas; Mountain Laurel; Rose of Sharon; Roses; Crepe Myrtles, which easily bloom here for 100 days; until we finally return to our fall Camellias. From Left: Mahonia aquifolium, Edgeworthia chrysantha, and Magnolia stellata blooming in late February in our front garden. This garden was already planted, by the original gardeners, with wonderful flowering trees and shrubs which we continue to enjoy. We have added many more, and continue to plant more flowering trees and shrubs each year. I just received a new Sweet Bay Magnolia from the Arbor Day Foundation, and have potted it up to grow in a protected place for its first year or two. 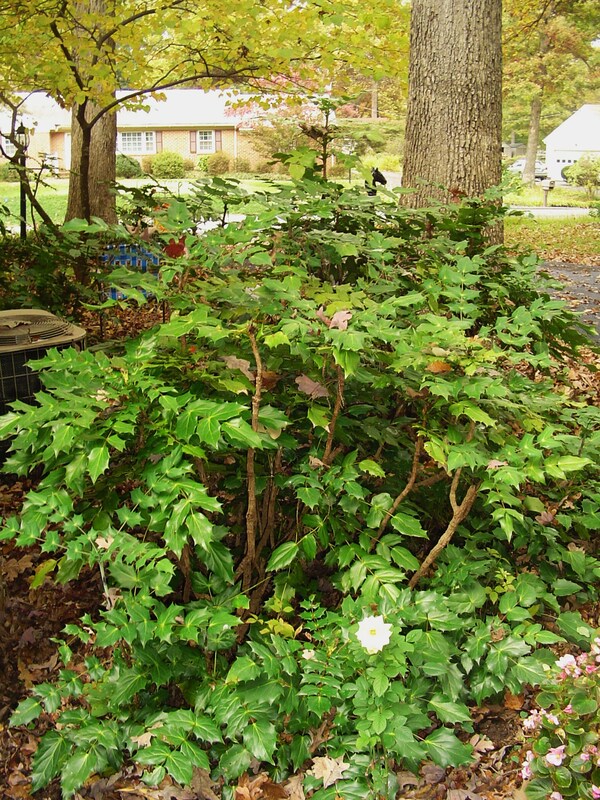 Most flowering shrubs perform well in partial sun to shade and can tolerate many types of soil and moisture conditions; which makes them good candidates for forested and shaded gardens. Flowering woodies remain truly fabulous in our garden! I am setting an intention to find some wonderful, beautiful, and happiness inducing thing to write about each Friday. Now that the Weekly Photo Challenge has moved to Wednesdays, I am starting “Fabulous Friday” on Forest Garden. If you’re moved to find something Fabulous to share on Fridays as well, please tag your post “Fabulous Friday” and link your post back to mine. Happiness is contagious! Let’s infect one another! for want of gold. I have seen a little of it. no function with which we cannot easily dispense. natural resource for their survivals. Helleborus argutifolius ‘Snow Fever’ offering its first flowers of the season. and whatever is done with love is done well…. was in the beginning and ever shall be…. “Go out in the woods, go out. and all the wonders in it. Winter weather is forecast to hit us hard this weekend. Snow will begin to accumulate here on Friday evening and we expect snow most of the day on Saturday. If the forecast holds, we’ll have a low of 12F on Sunday night. Now that is very unusual for us here in coastal Virginia. We aren’t generally prepared for such cold, and many of our garden plants don’t respond well to cold. Beautiful hybrid ivy looks fresh and elegant throughout the year. This grows with Violas in a hanging basket on our deck. TheViolas will fade in early summer’s heat, but eventually, the ivy will fill the basket and persist indefinitely. Because our winters tend towards mild temperatures, many of us keep on gardening between November and March. Although we get an occasional blast of freezing rain or snow, and often have night time temps down into the 20s; we also enjoy long stretches of days in the 40s and 50s. Occasionally we enjoy days, like today, with temperatures into the 60s. We have lots of song birds and squirrels playing around the garden, owls hooting from the ravines, hawks hunting from the tallest oaks, and even a moth clinging to the windows now and again. Autumn Brilliance ferns, Mahonia and Edgeworthia chrysantha maintain a beautiful presence through the worst winter weather in our garden. And I’m just in from transplanting a few of the first seedlings appearing from the bright red Arum italicum berries I planted into a protected spot last August. Tiny curled leaves have appeared, poking above the soil, since Christmas. And I moved a couple of them to a pot on our porch to keep a closer watch over them. As Arum italicum nears the end of its season, its berries redden and its leaves wilt away. It will sprout new leaves in the autumn, growing strong and green all winter and spring. Arum italicum appears in autumn and grows beautifully here all through the winter. Its leaves produce their own heat, melting ice and snow from around themselves, emerging brilliantly green and unharmed from a snowfall. The leaves remain pristine and provide a lovely ground cover under shrubs and around spring bulbs through early summer. They bloom and fruit, and finally begin to fade away at the height of summer when one barely notices. They remain dormant until the show begins again the following autumn. I can’t imagine why these beautiful and useful plants aren’t already wildly popular in our region. They fill an important niche in the garden year, are too poisonous to interest deer, spread easily, prove hardy and easy to grow, and provide three seasons of interest. What’s not to like? Arum italicum seedlings have just appeared. But I’ve never found them at a garden center potted and growing. I’ve only seen them offered in catalogs as dry tubers, and have gotten ours from Brent and Becky’s Bulbs in Gloucester. Brent and Becky Heath’s display garden features many fall and winter blooming shrubs, including this lovely Camellia. The Heaths call Arum a ‘shoes and socks’ plant because it works so well around shrubs. After a few years, it spreads and forms a beautiful ground cover. 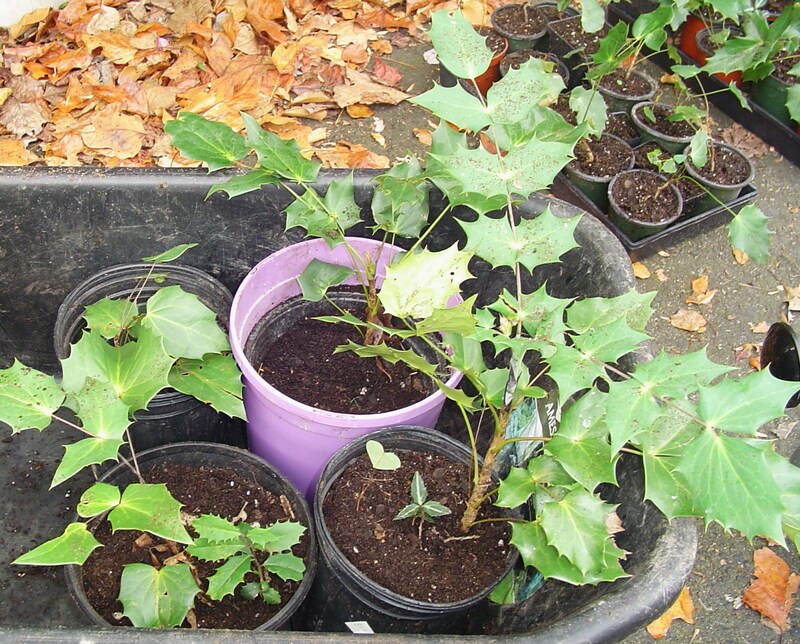 Another useful, but often maligned, evergreen for winter gardening is ivy. Like Arum italicum, ivy owns a spot on the ‘invasive plant’ list in our state. But I’ve always appreciated the elegance ivy will lend to a pot or basket. Although it can eventually swallow a tree, if left undisturbed, its growth is slow enough that an attentive gardener can manage it. English Ivy, Hedera helix, serves as a dense, evergreen ground cover in many Colonial Williamsburg gardens. It requires little maintenance beyond periodic trimming. Ivy, Hedera species, can tolerate very cold temperatures and emerge from snow and ice unharmed in most cases. There are many beautiful cultivars with variegated and beautifully shaped leaves from which to choose. Shade tolerant, it can also manage in sun, and eventually produces both flowers and small berries for wildlife. Ivy growing with Heuchera, which also grows through our winters. I like ivy as a ground cover, too, and it is used extensively at Colonial Williamsburg in the gardens around historic homes. It will eventually crowd out other plants, if left unchecked, much like Vinca minor. It roots from each leaf node and produces a prodigious root system over time. Hellebores have become a third indispensable plant in our winter garden. Also evergreen, like ivy, they maintain a presence throughout the entire year. But they grow best during the cool months, awakening again in late autumn with fresh new leaves. As the older leaves begin to look shabby, it is good to cut these away to make room for their emerging flowers. Although the root system continues growing larger each year, the plants themselves may be renewed with annual cutting back of their old leaves in early winter. In February 2016 Hellebores grow here with Autumn ‘Brilliance’ fern and strawberry begonia, which also remain evergreen through our winters. Hellebores, also poisonous, will not be affected by grazing deer or rabbits. Early pollinators appreciate their winter flowers, as do we. I grow these in pots and in beds, pairing them with spring bulbs, Violas, ferns, Heuchera, moss and ivy. By choosing plants wisely, we have found ways to garden year round here in Williamsburg, enjoying beautiful foliage and flowers each and every day of the year. Even as we get an occasional snow or Arctic blast, these hardy plants bounce back quickly and keep giving throughout the season. New growth on an Oregon Grape Holly in our front garden. These shrubs bloom between December and February, providing nectar for pollinators during winter. Helleborus argutifolius just home and still in its Nursery pot in late November. Violas and ivy make fora beautiful winter hanging basket in our climate. Oregon Grape Mahonia, has always been one of my favorite garden shrubs. When I was a child visiting Maymont Park in Richmond, Virginia, I loved the Grape Mahonia planted on either side of the grand marble staircase leading from the upper gardens down to the Japanese Garden. I couldn’t name it then, but loved the huge bushes full of tiny yellow flowers and deep purple berries. The huge spiky leaves looked lush and friendly, softer somehow than normal holly bushes. I wanted to grab some of the berries to play with, but of course was never allowed to touch them. This seedling, three years in the garden, is beginning to form a clump. It will bloom this winter. That memory of the Mahonia stayed with me, and I was delighted to find a few old Mahonia shrubs on the border of our new garden here in Williamsburg. Often called, “Oregon Grape Holly,” Mahonia is native to the western coast of North America, from Alaska south to California. Evergreen and hardy to Zone 5, it is the state flower of Oregon. Mahonia in January. The leaves sometimes change color in response to cold weather, but its yellow flowers still welcome pollinators. Native cultures along our west coast used every part of the Mahonia shrub. Its seeds are edible, although very tart. They can be converted to juice, jelly, or eaten out of hand. They also make a beautiful purple dye. The inner bark can be rendered to a yellow dye. Parts of the plant are medicinal. Potted Mahonia blooming on the patio. The Mahonia in my garden are already beginning to grow new leaves, and bunches of bright yellow flowers will emerge in late January and February. They are an important nectar source for bees and other nectar loving insects who come out on warm winter days in search of food. Mahonia blooms brightly when most of the landscape is dormant. In their native northwest, Mahonia grow as an understory shrub beneath Douglas fir and pines. A clump of Mahonias grows and re-seeds beside my parents’ back porch. They prefer partial shade and rich, acidic soil. Drought tolerant, they thrive in a range of growing conditions from full sun to deep shade. This is a tough shrub, forming wide clumps, but staying neatly 5’-7’ high at maturity. Birds love Mahonia berries and spread seeds far and wide. 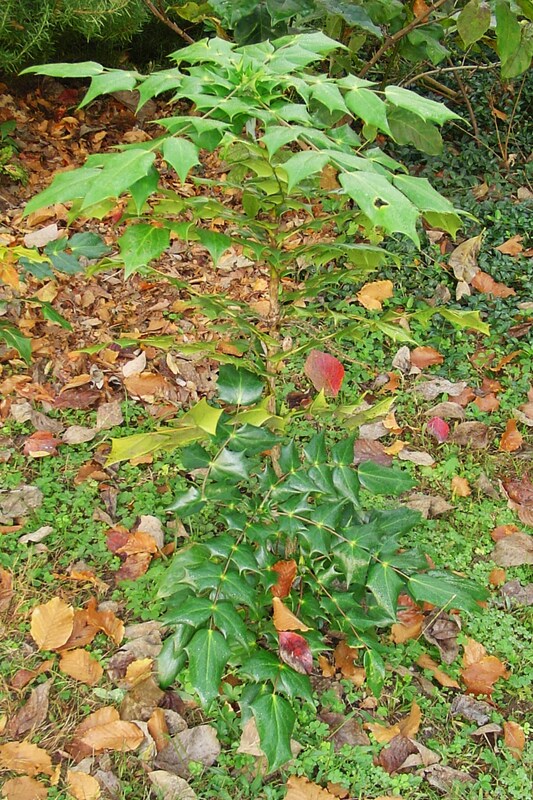 Mahonia grows so easily from seeds it is considered invasive in some areas of the Southeastern United States. Where you have a small group of Mahonia growing in moist, receptive soil, you’re likely to find a nursery of seedlings sprouting around them. Mahonia shrugs off snow and freezing weather. My parents have an established clump of Mahonia near their back porch. They allowed us to dig seedlings a few years back, and all we planted survived. I gave about half of that bunch to friends and planted the rest in various parts of the garden. Some have grown more than others, depending on the soil and light. As you might guess, the seedling I planted in a large pot on the patio has grown the most and gives the best bloom each winter. This transplanted Mahonia will bloom for the first time this winter. We’ve learned that the deer ignore Mahonia. So not only do the Mahonia have lovely sharp thorns on each leaf, they certainly won’t draw deer to the garden for dinner. This is another excellent prickly shrub to use along fences and boundaries. It is dense, once established, and makes a beautiful, if shaggy, hedge. Mahonia is also a great shrub to use as a background behind flower beds. Evergreen, it provides interest all year and makes a deep green backdrop behind warm season herbaceous flowers. It sparkles in winter and makes a beautiful vignette with evergreen ferns and ground cover in the foreground. Just when days are short and dark and rimmed with frost and snow, its tassels of bright yellow flowers will appear. A downside of Mahonia is its prodigious crop of seedlings. If you don’t fancy a Mahonia grove in your border you must pull them every year or so. My mother has been mentioning this for months now, and we finally made the trip in gardening togs with a supply of empty nursery pots. Mahonia has deep roots which grow much more quickly than the stem. The Earth was loose and moist, and so I was able to dig the seedlings without too much damage to the root system. I piled them, large and small, into a few large pots. She had a few bonus American Holly seedlings mixed in and insisted we take them all. Fresh potting soil over their exposed roots, these seedlings are ready for the trip home. 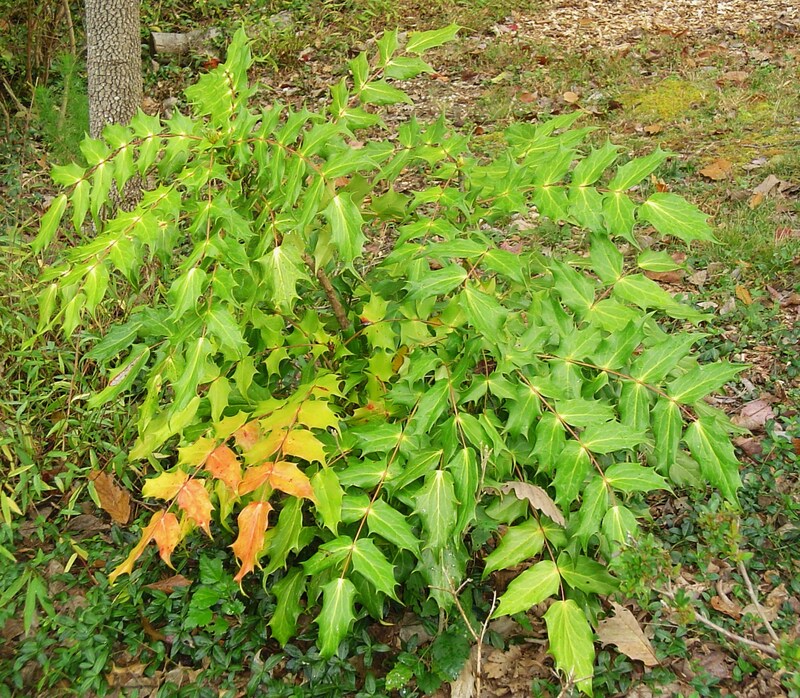 Mahonia doesn’t always transplant well because of its deep roots. Choose a day when the Earth is moist and the sky overcast if you plan to move some for yourself. I used a hand trowel because they were growing so close under the established shrubs. A narrow bladed spade would have allowed me to dig deeper for some of the larger plants. After digging for nearly an hour, I decided enough was enough, and begged some fresh potting soil to cover the shrubs’ roots for the drive home. My family wryly observed that I’m happiest with my hands in the dirt and smudges of soil on my face. We helped with a little raking, sweeping, and Caladium digging while we were at it. My parents brought most of their annuals in weeks ago, but we rescued a little “left behind” cane Begonia and called it a day. Seedling shrubs we dug from my parents’ garden . I potted these up to grow on a while before they go in the garden or to friends. Yesterday I sorted out the seedlings. We planted a handful of the larger ones and some with very long roots directly into the garden. 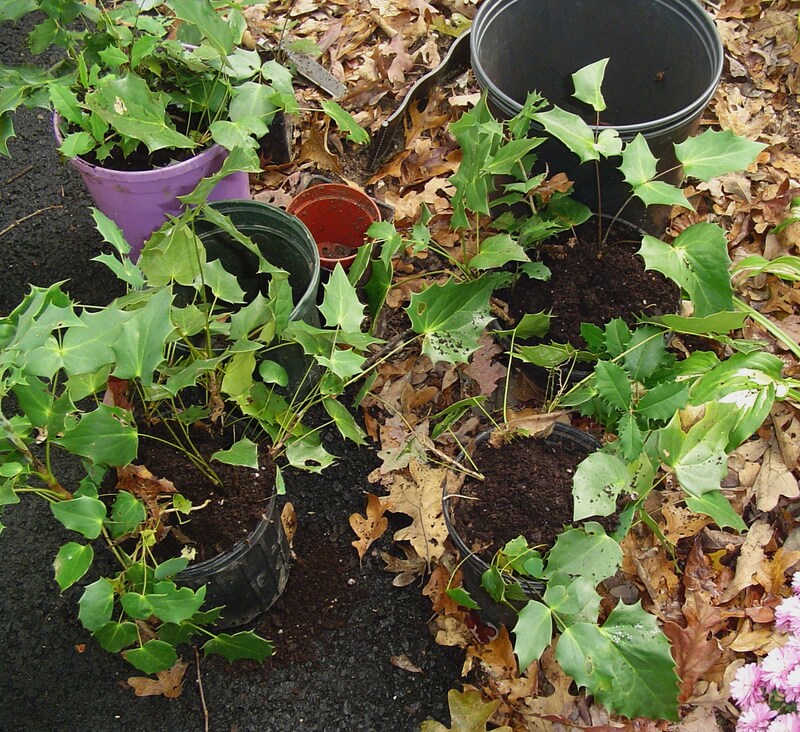 Most went into 4” pots to allow their roots to recover under optimal conditions before they are planted out. The tiniest seedlings went into some deep 1 ½ ” fern pots. They will grow on for several months before we plant them. We ended up with about 50 Mahonias, six hollies, and several bits of evergreen ground cover. My gardening friends are all invited to come over and adopt a few Mahonia if they have spots in their gardens left to brighten with a sturdy shrub. We planted the larger seedling shrubs directly into the garden yesterday. Neptune’s Harvest helps transplants recover from the shock. In addition to the traditional N-P-K nutrients, it’s full of minerals and helps plants get a good start. All of the Mahonia and hollies got a good watering with Neptune’s Harvest yesterday, and they’re getting watered in again today with the rain. Mahonia blooming at Colonial Williamsburg. 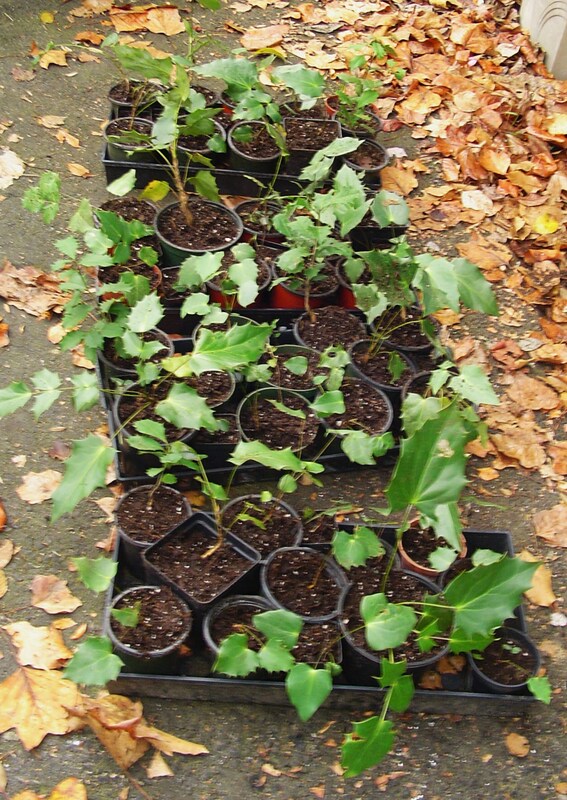 Our newest Oregon grape hollies will continue to grow through winter in our climate. We won’t expect flowers for at least a year or two, but these long lived shrubs have plenty of seasons ahead to brighten winter days and offer up little purple berries to curious birds and children.